Sanskriti (cultural practice) is a macro world encompassing the history and culture of people belonging to a particular tribe or race. It contains directives about religion, rituals, civilization, faiths, beliefs, phatic expressions & daily life. Our sages, philosophers and ancestors have always defined sanskriti according to the society and culture of their times and contexts. It is believed that sanskriti itself is the fundamental basis of our lives (Dharaand sanskriti ityahoo). Sanskriti brings light and inspiration into our life and plays an important role in daily activities and progress. Sanskriti is not just a word in a dictionary but a galaxy of lights and great thoughts and expressions. Every sanskriti in the world has its own importance and provides identity to its followers. This is the same for Nepali culture. Nepali sanskriti respects cultures of all communities, making Nepalis open-minded and democratic in their attitudes, and this is the reason it has flourished. This book aims to highlight and introduce precisely these dimensions of Nepali sanskriti. The author Durga Shakya is an expert on the subject. She has deeply researched and experienced the very act of protecting and giving continuity to the culture of worshipping the living Goddess Kumari, one of the rarest and most precious cultural practices in the world. This book is a result of her studies, her passion and her bhakti, or devotion. This is why I think this book has such great research and cultural value and I am very grateful to her for writing it. I am sure it will be a great help to those who want to know about and research this essentially Nepali tradition of worshipping the living Goddess Kumari. This book introduces our sanskriti and the history of our civilization in the most reliable and honest way. It also contains those important messages and values that reflect the great heritage of our civilization and the achievement of our ancestors. Durga Shakya has spent a great deal of energy and devotion preparing this book. Since the sanskriti of worshipping the ishtadevi Tulaja and Tulaja Bhawani has a long history, there are several cultural and spiritual directives and methods of conducting and practicing the puja or prayer. 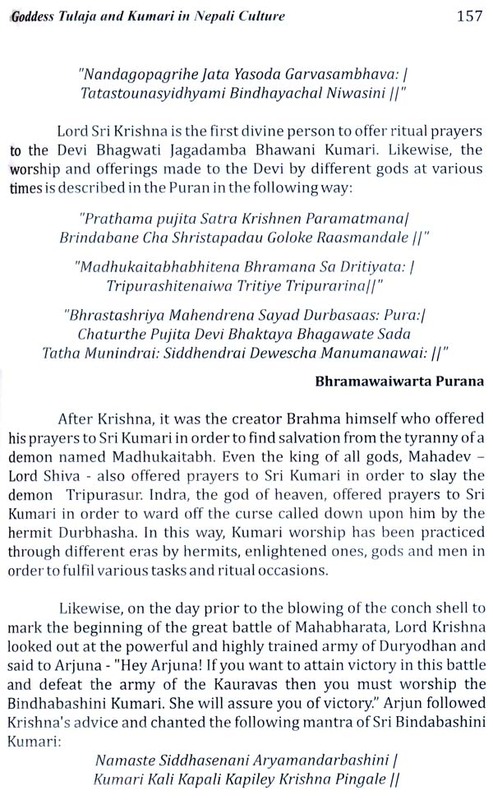 This book traces the modus operandi of worshipping the Goddess Kumari in its changing and continuous forms. It also introduces, defines, explains and demonstrates the various cultural and spiritual aspects of worshipping the living Goddess Kumari. This book contains a genealogical history of Tulaja Bhawani's arrival in Nepal, and charts the phases of the tradition of her worship that has come to settle in Nepal. The book also traces the origin of Kanya Kumari and upashana, or modes and manners of conducting fasting and puja in honour of Tulaja, and the culture of worshipping the living Goddess Kumari, and other issues related to other aspects of the Goddess such as Lakshmi, Shree Lakshmi and Gaja Lakshmi and others dated to the B.C. era and past cultural contexts. It contains photos of the images of various aspects of Lakshmi and also paintings of these goddesses. This book is sure to set a canon in the domain of research on Newar culture, and will certainly be a great help to students, researchers and scholars. I am confident this book will be read and appreciated by people from numerous fields. We once again request those interested in the ishtadevi Tulaja and Tulaja Bhawani to read this book and draw from it not only knowledge but also blessings from the Living Goddess. This book is definitely going to be very popular and useful for readers of all kinds. I wish Durga Shakya all the best for the future and in her research and publications to come. Durga Sbakya has written on the Kumari Tradition of the Kathmandu Valley for many years. She is one of the most important family member of the Chitaidars - the caretaker family of the Royal Kumari - residing inside the Kumari house at the service of the virgin goddess. Her mother Gyan Devi Shakya holds the Chitaidar title, and Durga along with her father, brothers and their wives and children offer their entire life to the service of the goddess. This book is an account of her understanding the tradition from the insider's perspective. Growing up with a number of Royal Kumaris in the same house and later taking responsibility of their daily needs since her adulthood has given Durga an experience of this tradition others can only imagine. For her, to live with the virgin goddess is a way of life. Durga has published many articles on Kumari and other literary works in various newspapers and magazines. This book features a combination of both freshly written chapters and previously published articles accompanied by rare photographs and figures. This book is an English translation of her original book from the Nepali language. Durga is equally an active social leader serving various positions in charity and social organisations. I would like to thank Ms. Durga Shakya for publishing a book on "Kumari" the Living Goddess. This is a valuable book written by an insider, who along with her family have served and are serving the Kumari for generations. I am so happy that finally a book has been written by an insider prospective which will demystify the myths and misconceptions which has floated for so long regarding a girl being worshipped as a goddess. These ideas in the popular conception began with a fiction novel of Bijaya Malla called Kumari, which was made into a film in the early 80s which had a storyline that if a Kumari gets married her husband will die and thus, she should not get married. Yes, there are mobility restrictions but in a patriarchal society this is a role model of how a society should function/ treat a girl. This is a system where the entire universe revolves around the girl/goddess where her every physical and spiritual needs are given utmost care/preference, where her happiness and well-being is of highest importance. Similarly, there are living Ganesh and Bhairav who are not given the same importance, as the Kumari but have to go through similar rituals. As the Kumari represents the sovereignty of the nation there are certain security measures that need to be taken like any other high officials. Ms. Shakya through this book has revealed insights on the tradition and practices, history and about the significance of this unique Nepalese cultural tradition. Given Ms. Shakya's knowledge of this practice, this is an authoritative book that provides first hand information and insight that no others have been able to provide yet. Living Goddess of Nepal is a representation of Tulaja Bhavani for the Hindus and Vajradevi for the Buddhists, both of the religious groups worship her with their own tradition and values. The Kumari is selected from the Shakya clan from one of the 18 Bahas. There are signs of divinity even before the births of living goddess, indicating her future destiny as the true embodiment of the goddess. She is endowed with 32 auspicious signs and displays the signs of her divinity. She undergoes a series of tests to confirm that she is a Kumari. A Kumari also has to come from a Shakya family, who are three generations of and are from the pure Shakya lineage of Kathmandu. To my knowledge for the first time, a book is being written about the Kumari from an insider's perspective and believe would clarify many misunderstanding about this tradition. I hope this traditional practice important to the Newar as well as other ethnicities of Nepal where femininity/shakti is worshipped as the highest power is viewed from the women's rights perspective and flourish with time. The cult of the Goddess Taleju and the tradition of worshipping Kumaris - 'living goddesses' - is central to the belief system that has sustained the culture of the Kathmandu Valley for seven centuries or more. Though other living goddesses still exist in the valley today, in modern times the focus has fallen primarily on the Kumari of Kathmandu, the embodiment of Taleju and the living goddess who has, since the unification of Nepal, been regarded as the root of political power in the country. Living in an exquisite 18th century courtyard overlooking the old royal palace of Hanuman Dhoka and the temples of Kathmandu's Durbar Square, the 'royal' Kumari has granted her blessing to generations of kings, imbuing them with 'shakti' - divine energy - and authority to rule. Even now, in the new Republic, Nepal's President attends the Kumari's residence every year during the festival of Indra Jatra to seek the living goddess's permission to govern the country. In the throne room at the front of the house, behind the famous golden window overlooking Durbar Square, he prostrates himself before the Kumari's lion throne, touching his forehead to her feet. This very public acknowledgement of the innate power of the divine feminine is echoed in many of the most important rituals and traditions of the Valley. In this extraordinary book Durga Shakya describes the mythical origins of the goddess Taleju, her arrival in the Kathmandu Valley, the establishment of her cult in all the significant towns of the valley, and the practice - unique to Nepal - of worshipping her in the form of a living child. Durga Shakya's intimate knowledge and first- hand experience provide us with unprecedented insights. As daughter of the Kumari's hereditary caretaker, Durga lives at the Kumari House- the 'Kumari Ghar’, or 'Kumari Chhen' - in Durbar Square, at the very heart of the tradition. Her daily life is bound up with the intricate layers of Hindu and Buddhist practices, both esoteric and exoteric, involved in the worship of the living goddess Kumari. I have been privileged, during the course of my own research into the Kumari tradition, to get to know Durga Shakya and I am deeply honoured that she has asked me to contribute this foreword to her book. Her unending kindness and patience over many years, and the warmth and hospitality of other members of her family, have been both enriching and enlightening. Amidst the ceaseless activity at the Kumari Chen, the rounds of festivals and daily pujas, the comings and goings of devotees and tourists, I have been struck, again and again, by the extraordinary selflessness, generosity and deep-seated devotion displayed by the Kumari caretaking family. Durga Shakya has grown up with and cared for successive generations of living goddesses. She has played with them, worshipped them, tenderly cared for them, and ultimately bid them fond farewells when it was time for them to return to the outside world. Like the rest of her family Durga remains strongly attached to all the former royal goddesses - many of whom have, for the first time, provided their own accounts of their experiences for this book - and continues to devote herself to the service of the incumbent living goddess. This fascinating book is a hugely important contribution to the study of the Kumari tradition and the history of the Kathmandu Valley, and will be of enormous interest to Nepalis and foreigners, general readers and scholars alike. In introducing us to life inside the Kumari House - a place where, for reasons of ritual purity, no foreigner can go- it provides a window onto a complex world that is often misrepresented and profoundly misunderstood. Above all, this book is testimony to the qualities of devotional self-discipline and 'maitri bhavana' - the pursuit of unlimited loving kindness to all - that have sustained the Nepalese people for centuries, and that future generations, not just in Nepal but the world over, would do well to understand. Words of Good Wishes - Ram Kumar Shrestha, Minister of Culture, Tourism & Civil Aviation. Words of Good Wishes - Prof. Dr. Bina Paudyal, Former Head of the Central Dept. of History, Culture and Archeology, TU. 21 Can the Kumari Get Married?